The ALA Annual Conference in New Orleans has come and gone, and those of us from Atlas Systems who attended had a great time. One of the benefits of working at Atlas is the opportunity to participate in professional meetings like ALA, which allows me to keep up on the latest developments in librarianship as well as keep in touch with my colleagues. High on my list of things to do at ALA Annual is the presentation of the awards that Atlas sponsors. Over the years I have been tasked with attending these presentations, and it is one of my most satisfying duties. This year we had four presentations scheduled, all of them during the RUSA STARS Summer Social at The Rusty Nail in New Orleans. The STARS Atlas Systems Mentoring Award has been around since 2007 and is given to a library practitioner who is new to the field of interlibrary loan/document delivery or electronic reserves. It provides $1,250 to fund travel expenses associated with attending the American Library Association Annual Conference. This year we had two recipients, Pearl G. Adzei-Stonnes from Virginia Union University and Guerda Baucicaut from the City University of New York. Congratulations go out from us to Pearl and Guerda for a job well done. Atlas Systems also sponsors the Rethinking Resource Sharing Innovation Award, for which we had two recipients as well – the IDS Project and the University of Wisconsin-Milwaukee Libraries. The award comes with a $500 stipend and honors individuals and/or institutions for improving access to information through resource sharing. The IDS project was recognized for IDS Logic, and the University of Wisconsin-Milwaukee Libraries were recognized for the development of an automated, user-initiated process for archival lending. The stipend was split between the two recipients, with Linda Kopecky accepting the award on behalf of the University of Wisconsin-Milwaukee Libraries. Mark Sullivan, Executive Director of the IDS Project, was not at the conference but Sue Kaler of the Massachusetts Library System and I presented the award to him and his colleagues at the IDS Conference at Utica College, New York in July. We extend our congratulations to both the IDS Project and the University of Wisconsin-Milwaukee Libraries for being recognized by their peers as leaders in the field of resource sharing. Interested in either of these two awards? More information can be found at https://www.rusaupdate.org/awards/stars-mentoring-award/ and http://rethinkingresourcesharing.org/. Perhaps one of us will be presenting you with an award next year! 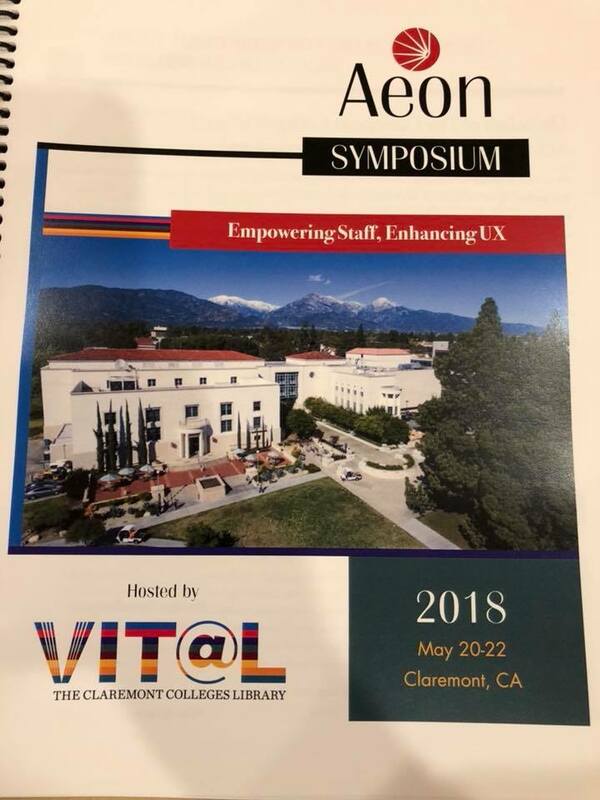 The 2018 Aeon Symposium was hosted by the Claremont Colleges in Claremont, California May 21-22. Many thanks to Lisa Crane at Claremont for spearheading this event and to everyone at the Claremont Colleges for hosting us. Aeon users received a festive welcome from a mariachi band at the opening reception, and the excitement continued throughout the Symposium. We were excited to release AtlasBI for Aeon at the Symposium, our new real-time business intelligence and reporting analytics tool. We are receiving great feedback about the reports and suggestions are coming in for new dashboard designs. If you are an Aeon customer with an Atlas hosted server, AtlasBI is FREE and available today. If you were unable to attend, we recorded most of the Symposium. The presentations and recordings are all available in the Atlas Video Training Library: https://training.atlas-sys.com/Course/Details/4320. Stay tuned for more information about the 2019 Symposium in the coming months. At the RBMS Aeon Users Group Meeting on June 21, we were joined by many current Aeon users and prospective customers. In addition to great conversation, I presented an Atlas Update. I shared results from the recent Aeon User Survey, information about Aeon integrations with ArchivesSpace, and some information about what is next for Aeon. Atlas is currently working on development to accommodate GDPR regulations and developing an API. In addition, we continue to migrate current Aeon sites to PCI Compliant servers. You can view the full slide deck from the update here. We look forward to seeing those of you who will attend the Aeon Reception during SAA on Friday, August 17 at Marriott Wardman Park.